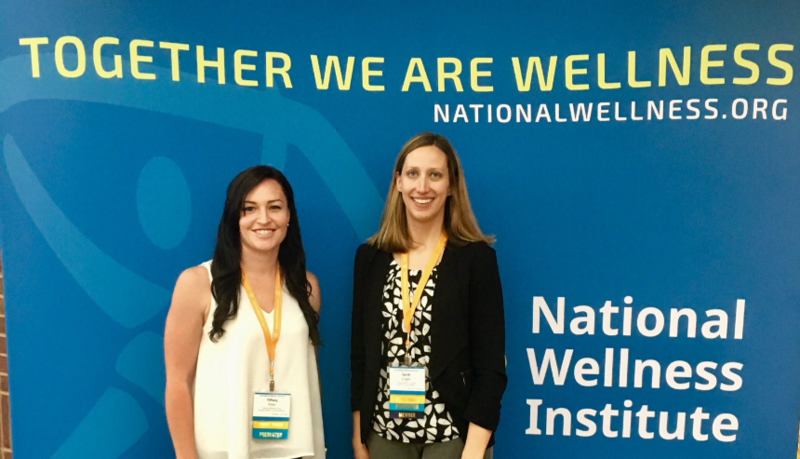 Two members of the BeneFIT Corporate Wellness team were selected to present at the National Wellness Conference, June 18-20 in St. Paul, Minnesota. Sarah Engler, MCHES®, Manager, Health Education and Wellness, and Tiffany Ritter, RD, LDN, CHWC, NBC-HWC, Board-Certified Health Coach, spoke to attendees at Saint Paul RiverCentre on the topics of resilience and emotional eating, respectively. Titled, “Navigating the Challenges of Burnout in Health Care and Coaching,” Engler’s presentation discussed how stress, burnout, and compassion fatigue impact health care and wellness providers. It also covered strategies for combating these conditions and boosting resilience. Ritter’s presentation on emotional eating, a topic of great interest among the audience, explained what emotional eating is and how to identity its emotional triggers. Focused on getting to the root causes of why people eat other than to satisfy physical hunger, Ritter identified strategies for regulating emotions and implementing mindful eating. The National Wellness Conference, an annual event presented by the National Wellness Institute (NWI), was formed in 1977 to provide health promotion and wellness professionals with resources and services that fuel professional and personal growth. The NWI community of professionals draws from every facet of health and wellness promotion including worksite wellness, government agencies/community outreach, education, mind-body therapy, spiritual wellness, and health care. The theme for 2018 was “Navigating Wellness: Mapping a Positive Path.” NWC programming focuses on all Six Dimensions of Wellness: Emotional, Occupational, Physical, Social, Intellectual, and Spiritual. Conference programming typically covers 10 tracks including coaching, higher education, integrative health/mind-body-spirit, worksite wellness, and more. NWI has already scheduled next year’s Annual Wellness Conference for September 30-October 2, 2019 at the Gaylord Palms Resort & Convention Center, Kissimmee, Florida. View BeneFIT’s series of health-oriented webinars targeted to employers here.